harrisson 32C eq, Software parametric EQ from Universal Audio in the UAD Plug-In series. Download authorisation for your UAD card and you're good to go. Can't say enough good things about the UAD plugs stability on OSX or PC. 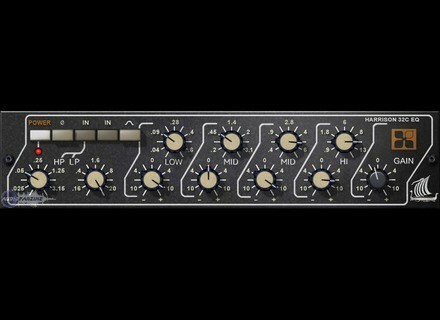 The Harrison 32C is the EQ channel module from the prestigious Harrison 4032 console. Countless hit records have been made with Harrison consoles, with artists from Abba to Sade. Most notably, the 4032 is famous as the mixer from which many Michael Jackson records including Thriller—the best-selling album of all time—were made. An original 4032 still resides in Florida with Thriller engineer and Bill Putnam protégé Bruce Swedien, where he continues his love affair with the desk he calls “marvelous sounding.” Universal Audio’s plug-in version of the all-important 32C EQ module is measured from Mr. Swedien’s personal console. This colorful 4-band EQ with high and low cut fil- ters will impart the same “warm and rich sound” from his Harrison, and will impart the same “impact, sonic clarity and creativity” as he experienced mak- ing some of the best-loved records of our time. The Harrison 32C contains four overlapping parametric peaking bands. Each band has fully sweepable Frequency and Gain controls. Instead of traditional Q controls, the 32C has special circuitry that, according to the original hard- ware documentation, “automatically adjusts the effective bandwidth under all conditions.” This dynamic property, and the interplay between the overlap- ping bands, contribute to the device’s musicality and unique sonic signature. The low EQ band can be switched from peak to shelf mode, and high/low pass filters are available. Additional “digital only” features not included on the original hardware include gain, phase invert, and a global power switch. An SE version is also provided for higher instance counts. The UAD Harrison 32C SE is derived from the UAD Harrison 32C. Its algo- rithm has been revised in order to provide sonic characteristics very similar to the Harrison 32C but with significantly less DSP usage. It is provided to allow Harrison-like sound when DSP resources are limited. Nobody with “golden ears” will say it sounds exactly like the full version, but it still sounds great and is very usable in most situations.